I was born in Cortland, New York on July 4th, 1949. I’m recently widowed after being married for 47 years. I worked at Social Services as a welfare examiner, and my husband worked at a utility company. Before he passed, we decided to move to Florida to escape the Northern winters. When my husband was diagnosed with cancer, we decided to purchase a motor-home and travel around so we could see the United States together. I’m so happy we did so. We built up a lot of wonderful memories on the road. After he passed, I tried to re-sell the motor home, but was unable to. The only thing I had left to live on was a small retirement fund and my Social Security. That’s the main reason moving to a manufactured housing community made sense to me. It was one of the few places I could find that was affordable. I didn’t know anybody when I originally moved in, but what drew me into Carriage Cove was how friendly everyone was. We all work together to get things done. It’s a great place and the location is wonderful. It’s close to the beach, close to Nascar, and close to shopping. It’s a wonderful option for retired people like me. But the cost of living in the community has skyrocketed, and I’m not sure how much longer I can afford to live here. Because money is so tight, I’ve picked up a part time job working at a convenient market for $8.25 an hour. The job gives me some extra money to pay for groceries. It feels like everything else goes to rent and home maintenance. One of the issues I’m faced with living in this community is that my Social Security check, which I rely on to pay my lot rent, usually comes in on the second Wednesday of the month. If your rent isn’t paid on the 5th, Equity Life Style Properties charge and extra $5 a day. Even though I told them this is the case and that I pay religiously once my check comes in, they are unwilling to waive any late fees. Fees like that add up for me. The other thing that happened when I moved in is that I feel like they pulled a bait and switch on me. They told me that water, sewer, cable, trash, and lawn care included in my monthly rent of $578. But when I received my first rental bill, charges for water, sewer, cable, trash and a tax added on over $100 to what I now call my ‘base’ lot rent of $578. Since I’m paying all of the bills for utilities, I asked what my ‘base’ lot rent of $578 goes toward. They rudely said it went to their salaries. The more I think about it, the more I think they must have been telling the truth because they are putting no money back into the community. 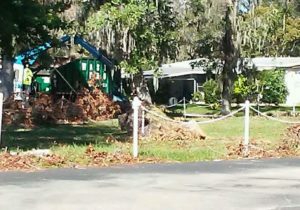 For example, ever since Hurricane Matthew over forty days have gone by and debris is still strewn everywhere in the community. Many of us moved the debris from our lawns to the curbside, but ELS has still not picked it up. This makes it hard for people to get around and dangerous as a fire hazard. The front entrance is cleaned up. Roads around office cleaned up, but nothing else. On top of that, our roads are in disrepair, and the main water pipes leading into the community are corroded. Right now, our community is in mediation for the rent. I’m not sure mediation will work because ELS seems to have made up their mind. Either we pay them the increased rent or take them to court, which none of us can afford to do in the first place. The number one issue in my mind is the need to establish rent control. All I see is money going into the pockets of Wall Street types and nothing coming back into the communities. People cannot afford to be in the community anymore and are putting their homes up for sale. Even selling them is hard to do now because the rents are too high. We also need to look beyond housing issues and work on shoring up our nation’s retirement security system. We need to work together to ensure that Social Security is improved and strengthened for our nation’s seniors. Social Security’s cost of living formula needs to better reflect the true costs that our families face. We also need to scrap the cap to ensure that millionaires and billionaires are paying their fair share. They are making all of their money off our hard working people’s backs anyways. It’s the least they could do. It’s due time that Senator Rubio, Senator Nelson and Rep. DeSanstis step up to protect the most vulnerable in our society.